According to the Bureau of Labor Statistics, the paralegal field is expanding to create over 250,000 new jobs by 2018. It’s a dynamic, exciting field that is rarely stagnant or repetitious, and encompasses a great many possibilities including immigration, environment, copyright, even nursing. The full-time positions pay very well in almost all states though paralegals are expected to work hard and possibly put in long hours when a case is going to trial. Many former attorneys are even stepping out of the courtroom and into the capacity of legal assistant instead. 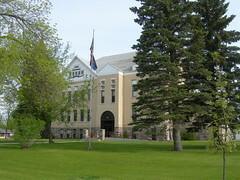 In North Dakota there were 300 paralegals employed as of 2011, or a fourth of all legal professionals inside the state. Inline with other states, there is a Law 5.3 that instructs a paralegal must work under the supervision of a licensed attorney who takes personal responsibility for the conduct and manner of the legal assistant and is also charged with teaching the assistant ethics and confidentiality. A paralegal may not be represented as a lawyer, give legal advice, take on clients as an attorney would and charge for time spent, nor may they represent a client in court. They may, and will, perform substantive legal and procedural operations, research, interview witnesses, greet clients and become liaison between clients and attorney, interpret and compose legal documents, and file among other things. What was once reserved for attorneys is more and more being handled by the paralegals. While there are no set rules for education in the field, there are requirements that must be met before being able to call oneself a paralegal. They are the completion of an Associate’s degree, a Bachelor’s degree or a post-Baccalaureate certification with an ABA (American Bar Association) approved school or similar; a Bachelor’s degree in any discipline with a year of work experience under a supervising attorney or 18 semester hours in legal courses; national certification and continuing education in order to maintain the certificate; and 7 years of on-the-job training in the paralegal field under the guidance of a licensed attorney and his/her sworn testimony of the fact. There are two terms regarding paralegals that sees some confusion: certificated and Certified. Certification comes from the completion of a schooling degree or Post-Baccalaureate diploma. While some of the schools will allow a course load that does not require a Bachelor’s degree first in order to obtain certification, the state will not recognize it as legitimate without the BA first, making it less than desirable. A Certified Paralegal is a title, not just a degree status, that indicates the legal assistant in question has taken and passed a national exam designed to showcase ability, competency, and experience in the field. The requirements per exam vary so it’s best to check the chart and make sure you meet the requisites. The cost of each exam also varies. There are four exams hosted by three nationally recognized paraprofessional associations. They are the PP sponsored by the Association for Legal Professionals (NALS); the CLA/CP sponsored by the National Association of Legal Assistants (NALA); and the PACE and the PCC, both sponsored by the National Federation of Paralegal Associations (NFPA). An ABA approved school is the best option for a hopeful paralegal; the ABA insists on certain stringent guidelines in educating future legal assistants and employers know the quality of talents that comes from this. An accredited school -one deemed superior in structure and presentation by a private, regional, or national authority such as the Department of Education- is also wise though not necessarily enough on its own to satisfy an employer. Sadly, the American Bar Association has no current listings of ABA approved schools in the state. However, Montana has two, South Dakota has three and Minnesota boasts five. It is strongly suggested that an aspiring paralegal join a local or national association of paraprofessionals for a number of reasons. The support is excellent and many report an increase of ability in the field after attending the many seminars and workshops held by established professionals. They can also provide job banks and networking in addition to displaying a seriousness of intent in the professionalism of the career. Many will also accept students or lawyers.